At No Name, we know meats. And to know meats in the Midwest, is to know tailgating. 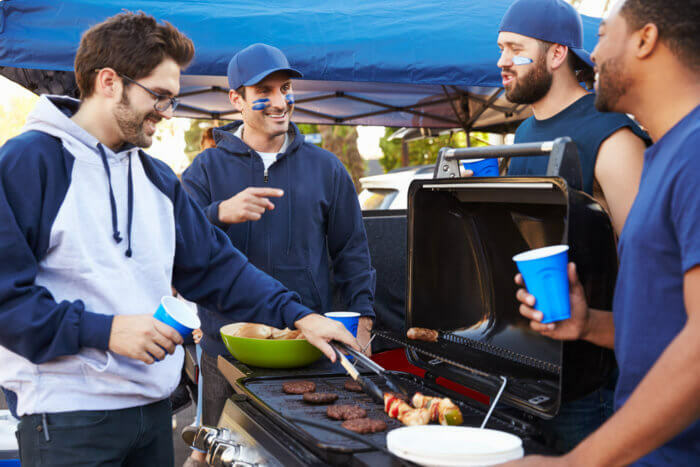 So, we’ve got some tips to help make your next tailgating experience your best ever. Figure out who is bringing what well in advance so you’re not scrambling at the last minute. Remember, you’re creating a mobile kitchen so it’s important to have the basics like grilling and serving utensils in addition to the cups, plates and food. Plan for clean up — napkins, paper towels, trash bags, foil and zipper bags will help keep you and your tailgating site clean. Bring a cooler filled with ice for tailgating beverages and it will have room to store any leftover food. Leave plenty of time to get there, find the perfect site, set up, eat and have fun and clean up before the game. Relaxed tailgating is much better than stressed and hurried tailgating. No Name meats don’t require any marinating, but if you’re making steak or chicken skewers, do the prep the night before. Remember the charcoal or propane. If using charcoal, bring a metal container with a cover for any still hot or smoldering ashes. Bring a solid griddle to put on top of your grill so you can cook up No Name Bacon for burgers! A DIY toppings bar is always a hit for No Name chicken or steak tacos or No Name Steak Burgers. Have a safe and fun tailgating season, No Name fans!